IC chip manufacturing processes, such as photolithography, etch, CVD, PVD, CMP, ion implantation, RTP, inspection, and metrology, are complex methods that draw upon many disciplines. 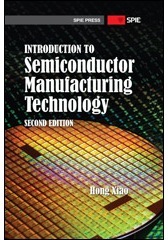 Introduction to Semiconductor Manufacturing Technologies, Second Edition thoroughly describes the complicated processes with minimal mathematics, chemistry, and physics; it covers advanced concepts while keeping the contents accessible to readers without advanced degrees. Designed as a textbook for college students, this book provides a realistic picture of the semiconductor industry and an in-depth discussion of IC chip fabrication technology. The text focuses on current fabrication technologies, but older technologies are discussed for historical context. 3.1 What Is a Semiconductor? When the first edition was published in 2001, the leading-edge IC technology node was about 130 nm. Shortly after the publication of the first edition, I attended an international IC technology conference where 90 nm was the leading-edge technology node of IC manufacturing. Former Honda CEO Hiroyuki Yoshino gave a keynote speech in which he talked about ASIMO, the robot Honda introduced in 2000. At that time, ASIMO could understand some simple words and follow few verbal instructions to walk slowly and speak simple words. Mr. Yoshino envisioned that in the future, humanoids like ASIMO would be able to run, walk forward and backward, and navigate stairs. Not only would they be able to understand speech, but they could also understand the speaker's mood. They would be able to identify individuals and human emotions through facial-image recognition software. However, 90-nm technology was not sufficient to achieve these technologies, and Mr. Yoshino believed that 22-nm-technology IC chips would be needed. A decade later, cutting-edge IC technology has reached 22 nm. An all-new ASIMO was introduced in 2011 that can run, dance, and use sign language. Whereas the older version of ASIMO is an "automatic machine" that needs an operator, the new ASIMO is an "autonomous machine," which means it can make its own decisions and actions based on environmental sensors. It has the intelligence to walk among a group of people without collision by adjusting its movement through the observation and prediction of others. It has the capability to recognize the voices of multiple people, and its image sensor is capable of facial recognition. Although the new ASIMO has made a huge improvement, it is still far from having the envisioned emotion and mood recognition capabilities; to achieve that, perhaps sub-10-nm-technology IC chips are needed. There have been many changes in the semiconductor industry and its manufacturing technologies over the last decade. Although Intel still keeps the bulk of its IC manufacturing technology in North American fabs, the center of IC manufacturing has shifted to East Asia, in nations such as Taiwan, North and South Korea, and China. The IC manufacturing fabs in Europe, Japan, and North America are declining at an alarming rate. The biggest challenge for IC-technology node scaling has always been patterning technology. As suggested by my predictions in the first edition, unforeseen innovations such as immersion lithography and multiple patterning have extended the application of optical lithography and further delayed the development of next-generation lithography. Many people helped me write this second edition. The book would not have been possible without the encouragement and support from my wife, Liu (Lucy) Huang. My elder son, Jarry Xiao, proofread several chapters. My current and former colleagues provided many useful suggestions; I would like to express my deepest appreciation to Paul MacDonald, Pierre Lefebvre, and Alan Liang.